Note: Acknowledged in 1689 as 10th Earl of Argyll by the Convention of Estates in Scotland; Privy Councillor 1689; attainder of his father rescinded 1689; an Extraordinary Lord of Session 1694-1703; a Lord of the Scottish Treasury 1696-1703. "William, by the grace of God, king of Great Britain, France and Ireland, and defender of the faith, to all honest men to whom our present letters shall have come, greetings. In as much as we bring to our royal recollection that our most loyal and well-beloved kinsman and councillor Archibald, earl of Argyll comes from an illustrious and most noble family with very distinguished members, and traces his line from most famous and most illustrious ancestors who have exercised functions of the highest trustworthiness granted to them with unblemished courage and singular good faith, and who have been distinguished with the highest titles of honour and dignity by our royal predecessors for their most famous actions in safeguarding and sustaining the royal crown; and likewise, we, being acutely aware that Archibald, now earl of Argyll has not only shown evident traces of his most noble ancestry in being equally constant, zealous and eager in his disposition towards us, and in his tenacious and indefatigable eagerness to adhere to our royal service, but has also given most sure indications and provided unmistakable witness thereof by promoting the interest of our crown whenever the opportunity has arisen; and in the exercise of the greatest offices which we have seen fit to entrust to his care, he has acquitted himself with the highest honour and renowned loyalty. We are most conscious and mindful of this, and so that the said Archibald, earl of Argyll and his family may be encouraged therein to continue and persevere in their customary loyalty, steadfastness and enthusiasm for our royal person and government by having a further and more ample dignity conferred upon them; know therefore that we have made, constituted, created and inaugurated, and by the tenor of this patent do make, constitute, create and inaugurate the forementioned Archibald, earl of Argyll duke of Argyll, marquis of Kintyre and Lorne, earl Campbell and Cowal, Viscount Lochow and Glenila, and lord of Inveraray, Mull, Morvern and Tiree. This we give and grant, and by the tenor of this patent we do give, confer and grant the foresaid Archibald, earl of Argyll, and his male heirs whomsoever, the title, honour, dignity and rank of duke. 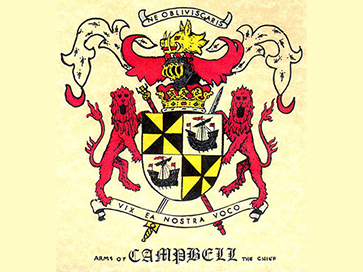 We declare and appoint the foresaid earl of Argyll and his foresaid heirs shall be named and designated for all future time dukes of Argyll, marquises of Kintyre and lords, earls of Campbell and Cowal, Viscounts Lochow and Glenila, and lords of Inveraray, Mull, Morvern and Tiree; and that they possess and enjoy the immunities, precedence, priority and suffrages in all parliaments, general councils, meetings of the estates and other meetings whatsoever, public as well as private, with all other immunities, liberties and privileges whatsoever regarding or able to regard any other duke in our kingdom of Scotland. The foresaid Archibald, earl of Argyll and his foresaid heirs are to hold and have the said title and dignity from us and our most illustrious successors with every pre-eminence and privilege relating thereto as fully and freely in every respect and condition as any other duke of our said kingdom possesses and enjoys; and further we wish and grant, and for ourself and our most illustrious successors we decree and ordain, that this our present letter of appointment shall be as valid, effective and sufficient for the forementioned earl of Argyll and his foresaid heirs to enjoy and possess the said title, honour and dignity of duke and the other titles aforesaid as if he had been invested and inaugurated with the solemnities and ceremonies usually employed in ancient times on similar occasions. We have granted, and by the tenor of this patent, do grant a dispensation therefrom in perpetuity. Moreover, we order the lyon king of arms and the brethren of his court to grant and prescribe such additions to his arms as shall seem to him and them to be appropriate for this occasion. In witness whereof, we have instructed that our great seal be appended to this patent. At our palace of Kensington, 23 June in the year of our Lord 1701, and in the thirteenth year of our reign. Signed by the hand manual of our supreme lord the king."